I few months back, I wrote about my experience with the six dimmable Philips LED bulbs I purchased a year ago. Those light bulbs all failed within months of each other in just over a year of use. This time around though, it’s the Crees ones that had bit the dust. They lasted a few months longer and were among the twelve I originally purchased. So I decided to open up one to see how the Cree LED bulbs were constructed. These particular Cree LED bulbs are dimmable, and are rated for 65W of incandescent equivalent light output while consuming around 9W of power. Like the failure mode of other LED bulbs, including the Philips ones I did a teardown with earlier, these LED bulbs either start flickering shortly after powering up or completely turnning off after a while. This is likely due to the overheating of the LEDs. While the LEDs and their driving circuitry are getting more and more efficient these days, the heatsinking capability of today’s LED bulbs has decreased somewhat compared to that of the older bulbs. This is likely due to cost cutting or aesthetic considerations. And the recessive ceiling light placement does not help the heat dissipation either. 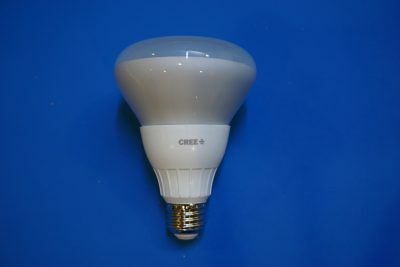 Upon removing the glass bulb enclosure, I was a bit surprised to see that only two power LEDs were used in this Cree bulb. Typically, you would see many more lower wattage LEDs put together to achieve higher wattage ratings. The two power LEDs are wired in series. 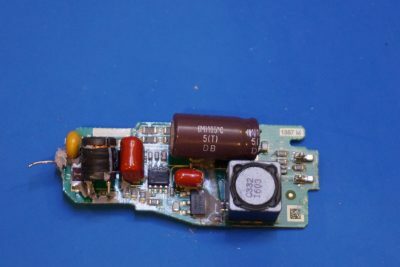 Each power LED likely consists of eight to ten LED dies inside as the forward voltage drop of these two LEDs is measured at around 70V in operation, with each dropping around 35V. 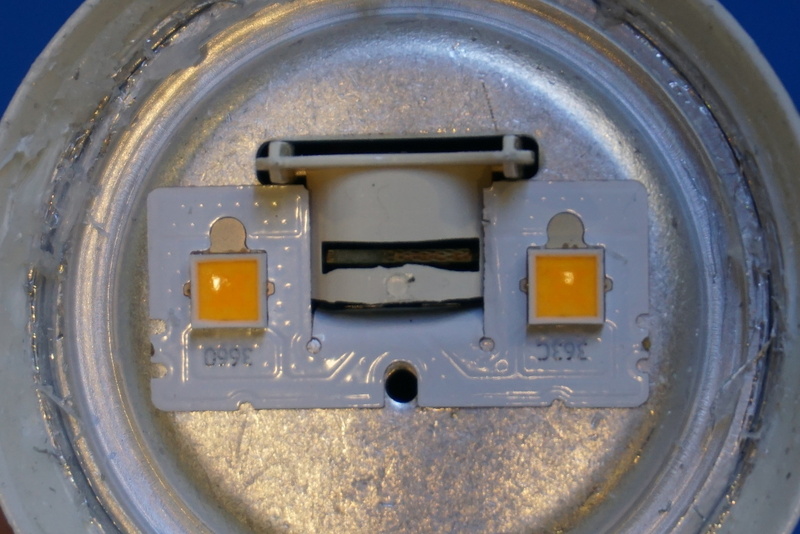 There is also a reverse polarity protection diode integrated into each of these power LEDs. The LED board is connected to the main circuit board via spring contacts rather than being soldered on, this likely improves reliability. Taking the circuit board out turned out to be quite challenging as the board is potted within the aluminum base. The picture below shows the driver board. I was able to remove most of the potting material, but there is still some left on the board. Unlike the construction we saw in the Philips bulb, here a dedicated dimmable buck LED driver IC SSL5231BT is used. According to the datasheet, this driver chip offers up to 91% efficiency with improved power factor. The measured power factor of this Cree LED bulb is just under 0.8. Since all the LEDs in the failed light bulbs remain operational, I decided to put together a simple light solution using the LED boards I gathered from the failed LED bulbs. Here I used three LED boards from three failed Philips bulbs and built a rather powerful overhead light for shooting videos. The three boards are connected in parallel and powered by a power adapter from an old HP inkjet. The power adapter I used has two outputs, one is 32V and the other one is 16V. 32V is just about the right operating voltage for the LED boards used in the Philps LED bulbs. To balance out the current draw of each paralleled board, an 1Ω resistor is placed in series with each of the LED board. 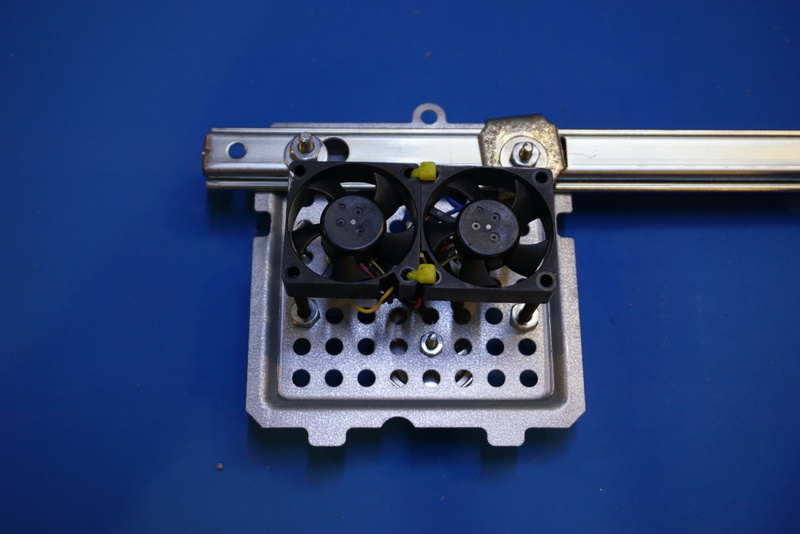 I also used the 16V rail to power the two 12V fans linked in series. Since the operating voltage is significantly reduced for the fans, they operate quietly and the airflow is more than adequate to prevent the LEDs from overheating. 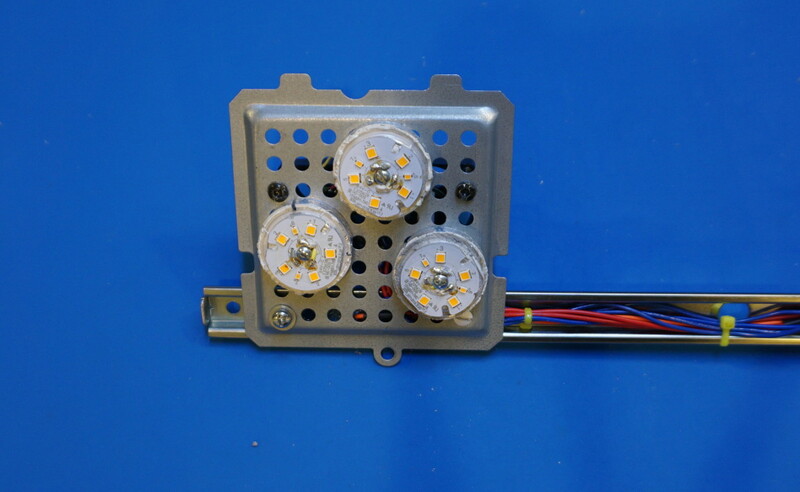 Here is the teardown video, you can see this DIY LED light in action towards the end.